Reliable Controls is pleased to announce the release of the MACH-ProPoint™ Input expansion module, a flexible solution for maximizing the monitoring capacity of a MACH-ProCom™ or MACH-ProSys™ controller. Each MACH-ProPoint™ Input expansion module features 24 universal inputs. MACH-ProPoint™ Input expansion modules can be mixed with standard MACH-ProPoint™ expansion modules in any combination on a single I/O-Net trunk. A maximum of 8 expansion modules can be connected to a single MACH-ProCom™ controller. Up to 7 expansion modules can be added to a MACH-ProSys™ controller. A single MACH-ProCom™ or MACH-ProSys™ controller can accommodate a maximum of 128 inputs and 128 outputs. 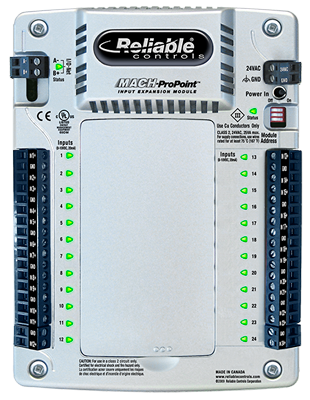 Learn about the MACH-ProPoint™ Input expansion module at www.reliablecontrols.com/MPP-I.